When it comes to gear fishing for salmon in rivers, there are two common techniques which anglers prefer. We either prefer to float fish with a variety of bait such as roe, worm, shrimp, artificial presentations, or cast and retrieve so-called "hardwares" such as spoons and spinners. Each technique is best for a particular situation. 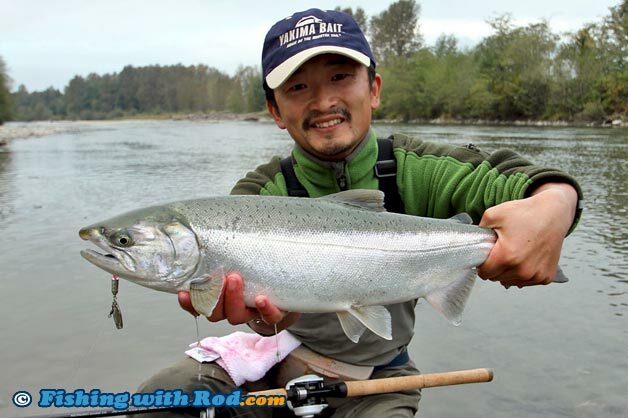 Float fishing works great, particularly for coho salmon, at a run with a moderate flow so you can drift through fish that are possibly staging in it. Lure casting works great in a deep spot where current is almost absent. By following these rules, your chance of connecting with a salmon is usually pretty big. It is not always that simple of course. More often than not, fish will decide to throw a curve ball. What if the run where you are fishing at is pretty shallow, almost too shallow for retrieving a lure, but these fish have no interest in anything else but a shiny spinner? To make it more challenging, what if the water is extremely clear and the only way to trick these easily spooked salmon is by almost suspending your lure in front of them? Under this scenario, you should consider combining both float and lure fishing into one strategy that can be extremely effective when all other methods fail. The float setup with a spinner rigged up is no different from how you would present your bait, except a few small modifications are needed. Your float is attached to the main line, a sliding weight or split shots tied to the end of your main line for float balancing, followed by a leader measuring around two feet, which is tied to a spinner. Unlike float fishing with bait, which involves freely drifting the presentation without any tension applied to it, float fishing with a spinner usually involves a constant slow retrieve or applying pressure on the lure against the river current. This tension keeps the blade of the spinner spinning when it travels through the water column. You need to lengthen your float depth slightly, because the slow retrieve keeps the line between your float and the spinner in an angle. Depending on how heavy your spinner is, you should adjust the amount of weight added to the line for float balancing. You can use a variety of spinners from a simple spinner blade rigged to swivels and split rings, to large inline spinners with a lure body. The heavier your spinner is, the less weights such as split shots or sliding weights are needed to balance the float. When deciding how much weight to use, you should also keep in mind that the pressure created by the rotating blade has a tendency to drag your float down. There are several techniques available when using a spinner under the float. You can simply cast and retrieve as you would when fishing with a spinner alone. The retrieve speed can be very slow, as long as you have direct connection with the float. The float keeps your spinner from snagging up on the bottom. Cast your setup slightly upstream from you and allow it to travel across the river back to you as you retrieve. The other technique is to allow your float drifting downstream by applying a constant pressure on the line. This keeps the spinner blade rotating against the current. As the float drifts downstream, it swings across the river and hopefully aggravates a salmon resting on the bottom. Because you are constantly retrieving, the amount of water being covered is usually not as large as when you are freely drifting a float. In some way, it is almost similar to swinging a large fly across the river. Unless there are fish holding in the section of the run in front of you, it is a good idea to constantly move, cast and retrieve. When a fish commit to the spinner, not only will the float go under the water, you will also feel the tug. The hookset is usually more firmly, because there is not any slack line between you and the lure. This can result in a higher landing ratio. Spinner fishing under a float can be used with either a baitcasting or centerpin setup. All you need to have are a few spinners in your pocket without the need to carry one extra spinning rod. This style of fishing presents your spinner in situations when you simply cannot do it by spin casting. It can be deadly at dawn when salmon are not selective on what they wish to attack. If all other presentations fail, definitely give this a try.